Loose-leaf Links is a feature where I gather together the interesting bits and pieces on sci-fi, fantasy and romance I’ve come across and share them with you over tea. Today’s tea is a bit of a cheat, not being actual loose-leaf tea at all. Despite rumours to the contrary, I’m not actually a tea snob EXCEPT when it comes to powdered chai lattes. 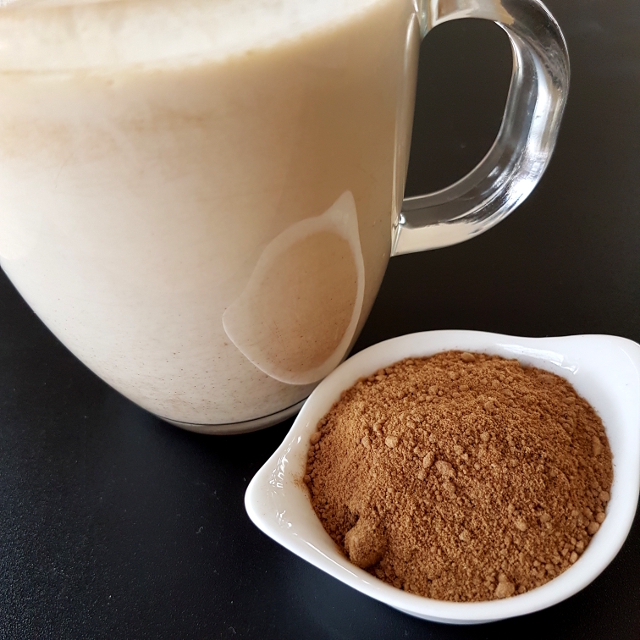 I recently discovered this Organic Chai Latte powder from Real Chai and it’s now the only way I’ll drink this particular beverage. The giveaway for Earl Grey Editing’s third anniversary is now closed and a winner selected. Congratulations, Sabrina Rourke, and happy reading! A quick note that this afternoon I’ll be appearing on ABC Radio to review Kaaron Warren’s award-winning horror novel The Grief Hole as part of Laura Tchilinguirian’s Big Book Club. File 770 continues to report on the mess surrounding the Dragon Awards. Administers were refusing to accept nominee withdrawals, but have since changed their mind. However, the damage has already been done. Their initial refusal set off warning bells for N.K. Jemisin, who has now also withdrawn her nomination. The results of the Hugo Awards were announced. Congratulations to all the winners! Stats geeks can find voting and nominating numbers online (PDFs). The shortlists for the 2017 Inky Awards have also been announced. The award recognises achievement in young adult literature, with nominees and winners selected by their intended demographic. Voting is currently open for the winners, so teenage readers are encouraged to check that out. In the wake of WorldCon 75, Rivqa Rafael has a Storify of the panels she saw and live-tweeted. These include In Defence of the Unlikeable Heroine, Non-binary Representation in Fiction, Evolution of Feminism in Science Fiction and Fantasy World-building without Ableism as well as others. Jaakko Stenros and Markus Montola discuss WorldCon’s decision to pull the contentious LARP A Home for the Old from the program. Dublin is now officially holding WorldCon 77 in 2019 and have announced several Guests of Honour. A new draft of the program for Conflux has been released. Today is the deadline for fans of colour to request assistance from Cons or Bust to attend upcoming SFF conventions–including Conflux. Kat Rosenfield’s recent Vulture essay on The Toxic Drama of YA Twitter caused a few reactions. Foz Meadows analyses the situation. And over at Bustle, Sona Charaipotra and Zoraida Cordova push back at Rosenfield’s assertions in their essay How YA Twitter is Trying to Dismantle White Supremacy, One Book at a Time. Victoria Schwab is furious after Russian publishers of her Shades of Magic series removed a queer plotline without permission and in contravention of their contract. Nicolette Barischoff, Personal Essays Editor for Uncanny Magazine’s Disabled People Destroy Science Fiction, discusses representation of disability in science fiction in a guest post for the Book Smugglers. Michael Meinberg has a thoughtful post on decolonising RPGs. A reminder that the forthcoming Mothers of Invention anthology, edited by Tansy Rayner Roberts and Rivqa Rafael, closes for submissions on 31 August. They’re accepting stories of 500-5000 words on gender as it relates to the creation of artificial intelligence. The Magazine of Fantasy and Science Fiction (F&SF) are currently open for fiction submissions. Glenda Larke discusses how to get rid of the boring bits in your story. KJ Charles discusses how the argument “you can’t judge it until you’ve tried it” doesn’t always hold true. Over at (the now Hugo-Award-winning!) Lady Business, forestofglory has started a new column on short SFF fiction. Her first post looks at Animal Brides. Ticonderoga Publications releases the cover for their forthcoming Ecopunk! anthology, edited by Liz Grzyb and Cat Sparks. Hodderscape reveals the blurb to Becky Chambers’ forthcoming book Record of a Spaceborn Few. Silvia Moreno-Garcia is crowdfunding her new sci-fi YA novella Prime Meridian.